This is based on an old post by Carl, The World’s most ill begotten piece of real estate – Part III, which has been slightly reworked. The Chinese have a saying, “May you live in interesting times”. And it is in no way a friendly thing to say; on the contrary it is a rather magnificent curse. In Naples people live all their lives in interesting times. If it was not enough with being the poorest city in Italy, they also have to contend with the Camorra (local mafia), drug-wars, corrupt politicians, strikes and general civil unrest. To top it off even further they have built their city on top, or around, no less than 3 active super volcanoes. Could the times get more interesting than that? Well you could add large earthquakes and tsunamis to the list. 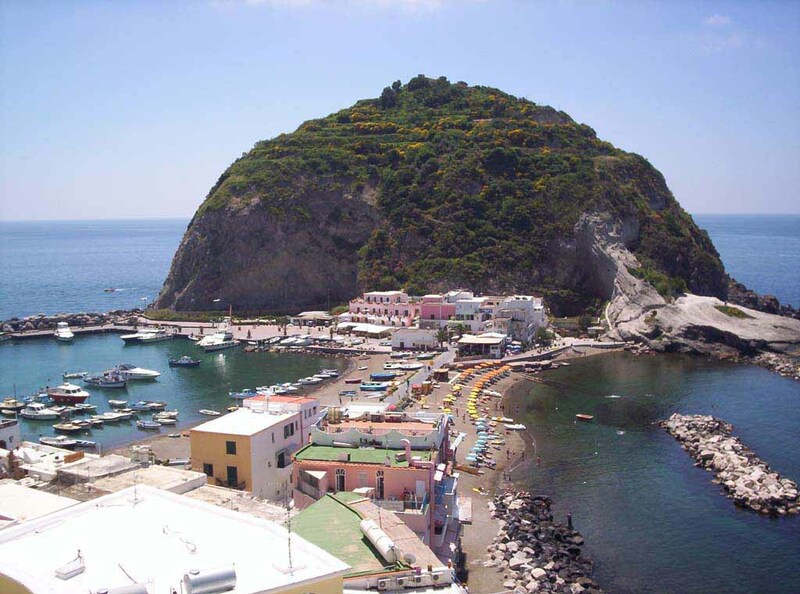 Ischia, or more correctly Monte Epomeo, started it’s activity about 350 000 years ago. Technically it is of the complex volcano type. During the first 300 000 years it grew and developed a large edifice paired with an over-sized volcanic sub-structure. 56 000 years ago the volcano had reached the critical level where the edifice was too large and heavy to be sustained on top of the very large magma chamber. The eruption probably started as a very large VEI-6 eruption that emptied out the magma chamber sufficiently for the roof to collapse. And since Ischia is an island it then got messy as the ocean roared down into the open magma chamber. The ensuing VEI-7 explosion created the Green Tuff Ignimbrite. This Green Tuff Ignimbrite should not be confused with the even larger Pantelleria Green Tuff (Italy is rather interesting…) that covers most of the Mediterranean area. Photograph showing Sant Angelo D’Ischia, another resurgent dome from a flanking vent. After the eruption the island was completely gone. As far as is known a 23 000 year long period of dormancy followed, but there might have been minor subsurface eruptions that helped to start healing the roof of the volcanic chamber system. 33 000 (Ar/K-dating) years ago a new phase started where the volcano had frequent effusive eruptions that helped to weld the tuff together healing the roof of the magma chamber along the entire 10 kilometer wide caldera. 28 000 years ago things started to get really interesting. By then the roof above the chamber was sufficiently structurally sound to hold for the increasing pressure inside the chamber. That caused the entire roof to be pushed upwards. Most of the readers in here are familiar with the concept of resurgent lava domes. We have all seen them being pushed out of craters like odd plugs. For those interested in seeing the phenomenon I recommend Soufriere Hills at Montserrat. Thing is though that it is normally smaller craters that suffer from this rather dangerous condition. The island of Ischia photographed from Castle Aragonese. The mountain area in the background on the island is Monte Epomeo, a resurgent dome formed as the caldera floor is lifted up above the caldera rim. Here be Dragons. Problem here is that Monte Epomeo is a super-size resurgent dome. Just imagine the pressure needed to push up a ten kilometer wide plug 900 meters in 28 000 years. I know, we are only talking about 3.2 centimeters per year on average, but it still requires rather stunning amounts of power. The uplift is though larger than that, the reason for that being failures in the resurgent dome with rock-slides and sector failures of the dome as it started to stick up above the caldera rim. 5 600 years ago the dome passed the rim. During the push up phase the dome had also dragged the caldera rim with it above surface, and around the island an elevated area has been created by the pressure. So, a lot of pressure has gone also into moving parts that technically are not a part of the resurgent dome. Now a resurgent dome is in itself not eruptive and Mount Epomeo is not a volcano. It is a solidified mass, and the rising force is not just the magma below, but also the removal of the weight above, in the eruption. The resurgence is not a danger sign. But there is still magma around, as shown by the behaviour. The most common type of eruption at Ischia is smaller eruptions taking place between the resurgent dome and the caldera rim. There are quite literally hundreds of fissures, cones, and other volcanic vent types encircling the dome. These eruptions normally follow episodes of rapid surging (uplift) of the dome. There are two more dangers on top of the island caused by the resurgent dome. The first one is quite simply sector collapses, landslides and rock-falls as the brittle welded tuff suffers structural failure. Some of these slides and rock-falls have reached as far as the coast line. The more dangerous version of failure is the lateral flank eruption. That happens as magma pushes upwards and builds up tremendous pressure and swelling of the side of the dome and the side of the caldera rim. Think Mount Saint Helens here and you get the picture. This causes a large pyroclastic flow going laterally over the island until it reaches the coast, then it will continue over the water. If it happens in the wrong direction it will hit inhabited land. During the last 12 000 years there has also been 3 sub-surface collapses of the island causing massive debris flows running out into the Tyrrhenian Sea. And there are several spots along the coast line where parts of the Island have calved off into the ocean. When this happens large tsunamis will race into the Bay of Naples destroying any part not high up. The latest known widespread tsunami in the area is known to have happened 800BC according to written records. Debris flow from a sub surface failure of the shelf around the island. The surge direction caused a large tsunami to go into the Bay of Naples. In the end, any island volcano is a danger. Magma and water are not a good mix. The location at the Bay of Naples does not help either, as this benefits tsunamis (remember Krakatoa!). And flank collapses, from whatever cause, can cause such a tsunami even while the volcano remains deeply dormant. Even though Ischia is currently not showing any sign of erupting other than the steady uplift she is deemed by Guido Bertolaso (head of the dipartimento della Protezione Civile) to be the most likely volcano to erupt due to the rapid buildup of magma that they have recorded. Bertolaso even went so far as stating “if I had to say which is the volcano with the most loaded gun barrel, I’d say it’s not Vesuvius but the island of Ischia”. He though went on to state that no eruption is imminent. This becomes evident if one looks at the lack of heightened volcanic tremor, and minimal amount of magmatic earthquakes. The risks are roughly discussed below in the order of likelihood. Ischia is the volcano most likely to have a large eruption in the Naples area. One should though remember that it is most likely to have a normal VEI-1 to VEI-4 eruption when it erupts next. This would mainly affect the 60 000 residents on the island, and the same amount of tourists. Rock falls, dome failures and landslides from Monte Epomeo is also fairly likely to happen in the foreseeable future due to the resurgent dome uplifting. This will also only affect the local residents and tourists. Large landslides either at the coast, or out on the elevated shelf that surround the island is fairly likely to happen within the next few thousand years as the pressure building up raises the land up and weakens the structure of the flanks. When this happen large tsunami waves will hit the Bay of Naples causing widespread destruction. This is also the risk that is hardest to predict and mitigate. Ischia early in the morning. The sleeping Dragon rests calmly. And now Ischia is back in the news. A minor earthquake hit August 21, which caused a surprising amount of damage, as well as two fatalities. The response of the Italian emergency services has been exemplary, and their rescuing efforts certainly have avoided further fatalities. We salute their work. 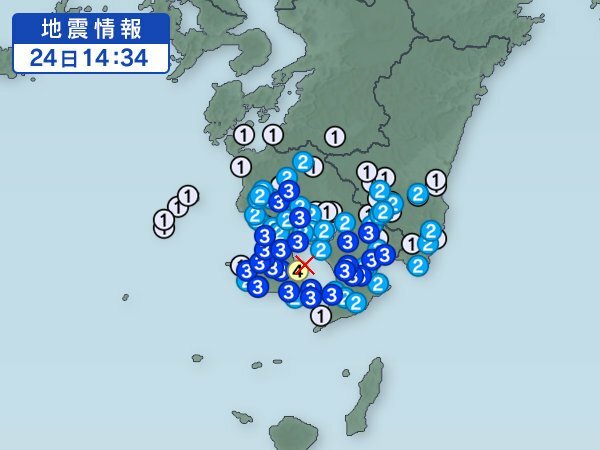 But why did such a small quake (M4.3) do so much damage? And what does it mean for the future? The earthquake was very shallow: initial estimates put it at a (default) 10 kilometer, but now it is placed at only 2 kilometer. The shallowness magnified the effects on the surface. The buildings may also not have been sufficient resistant to shaking. Some people have expressed concern about the use of the local tuff as building material. There is no indication that this earthquake is volcanic in nature, even though the entire island is of volcanic origin. It also appears completely unrelated to the increase of activity around Solfatara, where scientists have considered the possibility of a small eruption in a few years time. The most likely cause may be local subsidence. A very sudden drop would also have increased the surface acceleration, and would fit with the enhanced damage. 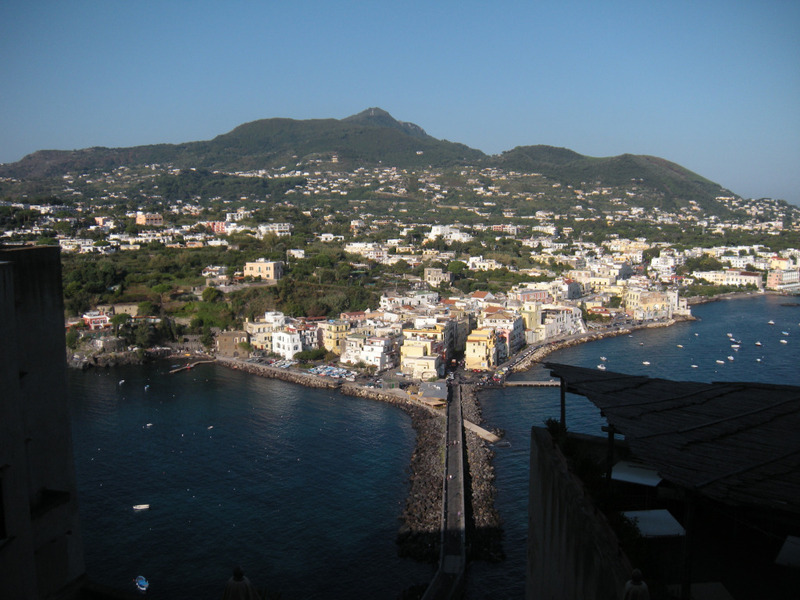 Ischia has shown strong subsidence since Roman times. On the northeast, a roman foundry is now 7 meters below sea level: much of the subsidence may have happened around the 1st century AD. On the southern side, a beach has been uplifted by 15-30 meters but the region is currently taking part in the subsidence of the island of around 3 mm per year. Has this happened before? The last major earthquake here was on July 28, 1883, at the town of Casamicciola. It was 9:25 pm and the richer people were at the theatres. (The location of the less wealthy people was not reported.) 25 seconds of shaking left the town completely destroyed, as were nearby Laco and Forio. There were an estimated 2300 fatalities. There was little damage at Ischia (the town on the east coast of the island of the same name), and the quake was only just felt at Naples. The fact that the damage was so localized suggest it also was not that strong (M5.5, perhaps?) but shallow. There have been no significant earthquakes since. The damage corresponded to XI on the Mercalli scale. 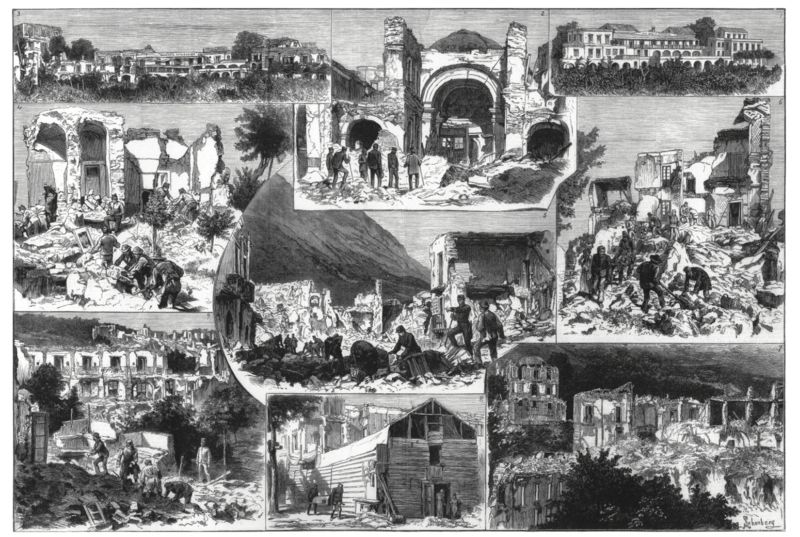 (An interesting aside is that Mercalli himself studied the aftermath of the 1883 earthquake on Ischia.) Compared to Naples itself, which was hit by an M7 37 years ago, Ischia is not a major fault zone. Casamicciola was build on the northern slopes of Epomeo. Forio is on the west coast: here the shaking was vertical, suggesting it was near the epicentre. The locations suggest that the 1883 earthquake occurred at the same fault and place as the 2017 one. 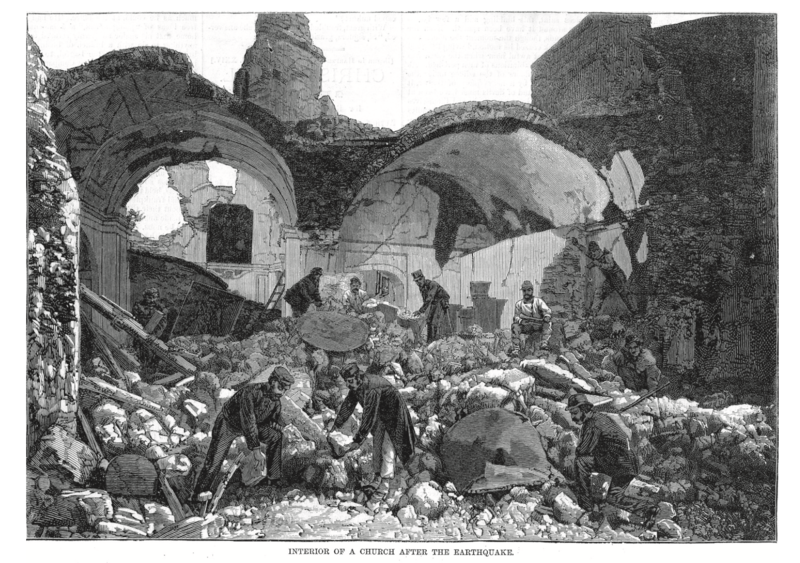 The 1883 Casamicciola earthquake, Ischia, Bay of Pozzuoli. Xylography print from The Illustrated London News (1883). Courtesy of R. Musson, Edinburgh. The most worrying aspect is that there had been an earthquake at the same location, two years earlier, on March 4, 1881, which had already severely damaged Casamicciola. This was also not a strong quake, VIII on the Mercalli scale, with a depth of 2 kilometer – identical to the 2017 one. There was also a weak earthquake on 25 July 1880. One of the damaged churches after the 1881 (not 1883!) earthquake. And the region had been hit before. On 18 March 1793, some houses were damaged and 7 people died in Casamicciola. On 11 April 1827 there was a quake felt throughout Ischia, followed by a much stronger quake on 2 Feb 1828 which hit -hold it – Casamicciola. The two reported further earthquakes in 1867 and 1868. Landslides are a major hazard. The uplift of Epomeo has left gradients as steep as 1:4, and rock falls are common. A rock slide in 1228 killed as many as 700 people. The message here is that there is a tendency for quakes to occur in pairs, 1-3 years apart, and the last quake may be the strongest. This would be a good time to check on the earthquake resilience of the surviving buildings. This area has history. Interesting updated post! Dangerous place, even small quakes could trigger slides and perhaps tsunamis! I hope there isn’t another quake in the next few weeks, I’ll be in the area in October!! Fyi; Albert is being modest with the update credits. All I did was technical assist in getting the original material in place so that it could be updated. And coming up with the idea to do this! The stunning bit to me, is “Mount Epomeo is not a volcano.” It is a resurgent dome of the volcano. I wish I could read Japanese – or at least figure out where the drums are located! Yesterday Sakurajima on webcam was exhibiting unusual behaviour – all night there was continuous strong incandescence and strombolian activity. The continuous strombolian activity is a little concerning to me. Earthquake activity picking up within the caldera proper is more worrying. I do not know what the change in activity means, but that uncertainty is what is concerning. From what I can tell, the magma coming up in the Showa crater that has been in a continuous strombolian eruption is likely much less viscous and evolved than the magma that had been erupting for the past 20+ years in strombolian style bursts. This tells me that the magma is being sourced more directly from the deeper Aira reservoir in all likelihood. Sakurajima IS known in the past for having big lava flows with more mafic magma, although most of these lava flows have occurred after somewhat more explosive eruptive events. Apologies up front, but this is OT. First, take a look at a really old plot I did several years ago. Before you beat me up over it, yes, I know that fitted poly curves are horrible. Just remember that they only mean anything for the data realm that they were fitted to. Now refer back to my plot. You will notice that winds up into the Cat-3 realm are conceivable. It doesn’t mean that they are there, just that the central pressure is about right for a wind field that strong. That’s the sort of thing that makes me pay closer attention to what it’s doing. You can find that webcam here. And now Law Enforcement has showed up to warn people off the beach. For anyone interested, here are the tides for this area. Your graph is hard to understand. I see wind speeds on the y axis but otherwise i can’t make much heads or tails out of it. I live in Austin TX, which is right in the path but far enough inland so our only worries are a lot of rain. The folks in Corpus Christi have a serious issue to contend with though. This storm formed in the central Gulf of Mexico allowing it to utilize the entire Gulf for warm water, and I expect a decent chance of a really strong storm at landfall. Not understanding the graph is quite easy, it is one of my crappier efforts. The X-axis is the central pressure of the storm in question. The Y-axis are the wind speeds. 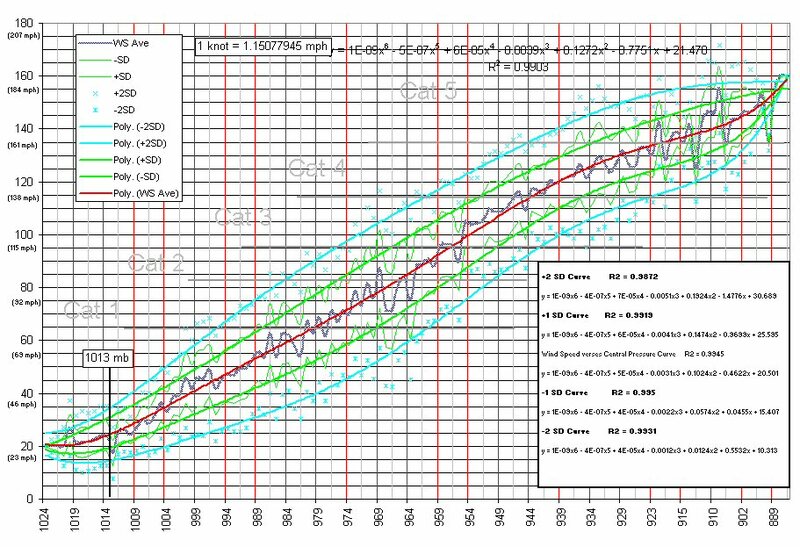 The idea is that the dark central curve is the average wind speed for storms of that pressure, The outer two curves are the 1 standard deviation and 2 standard deviation from the dark curve (average wind speed) To make things worse, that is about all I can remember about how I put the thing together. The idea is that data points (wind speeds) within one standard deviation of the average occur about 68% of the time. Within 2 standard deviations, about 95% of the time. The usefulness of the plot is that it gives you an idea of about what sort of winds would be normal for a given central pressure. With regards to Harvey, discussion 18 from NHC noted that the central pressure was measured by dropsonde at about 976 mb with no specific wind speed reported. So, the forecaster left the previous measured wind speed as the officially reported speed. Referring to my crappy plot, 976 mb usually means a wind speed of about 70 kts. But, according to the plot, speeds as high as 95 kts (109 mph) would not be out of the question. It doesn’t mean that it has that speed, just that it could be there and be perfectly normal for that pressure. Likewise, a wind speed of 45 kts wouldn’t be abnormal either. I usually use the plot to get an idea of just how bad a storm could be, not what it is reported as. It’s a way for me to mentally fill the gaps on what a storms health is. I always assumed something close to a 1:1 or “direct” relationship between central pressure and wind speeds. That is more or less what your graph shows. Central pressure is a nice measurement, but to fully relate it to the power of the storm might require a square kilometer component as well to determine how widespread the areas of low pressure are. 976 mb is not too bad. The big ones of the past like Gilbert and Wilma were both under 900 mb. Still like I said, it has strengthened in the central area of the gulf where many strong storms of the past including Katrina and Camille have strengthened before making landfall to devastating effect. It will be interesting to see what it does overnight and if it can pull together with a tight eyewall. The eyewall is currently unformed and disperse, but it looks like a storm that could come together Tomorrow (Friday) just before landfall. This is an interesting storm and could be intense. The problem with getting “square kilometer component” or any thing like that, is that I was limited to what data was available from the NHCs HURDAT file. I had wanted to redo the work with better tools, but by the time I had beter analysis and curve fitting software, NHC has changed the format of HURDAT to HURDAT2. With the effort at getting the original file into pressure windspeed pairs, I didn’t feel like going back and starting over on data I had already extracted. It’s doable, if I ever get the motivation to go back and repeat the work. My original data “pile” is buried somewhere here on a hard drive in a server that I haven’t booted in a year or so. (croaked NIC). The motivation to replace the NIC is countered by my desired to part it out and bring an old 1U server back to life. The 1U is a dual PIII 933 on a Tyan board. Far more robust than the one I was using. The other option is to take my old server (the one with the NIC issue) and rebuild it into a 4U case. The 4U has more room for drives than the 1U, but both options require me to get off my arse and actually do something. As for your Camille comment. I had the same thought. Both Harvey and Camille were podunk storms right about the time that they cleared the Yucatan and exploded into strong systems. Harvey is siting in a large swath of 31°C water, and it actually has a warm eddy on it’s northern side. Similarly, Camille rode a warm eddy all the way to the coast. My guess is that the gulp of dry(er) air that it took on it’s southern region today will have little effect other than slowing it’s strengthening a bit. To this day I am in awe about the ferocity of Camille. I was eight years old at the time and can still remember seeing its western Eyewall on WLBT’s new fangled weather radar as it passed over Pearl Mississippi… 159 miles inland. In retrospect, that isn’t much of an accomplishment. Tropical systems can retain their structure for a long time after they make landfall. In my experience they all get severely weakened shortly after making landfall. Yes, the Camille pattern is something I’ve noticed. The Gulf of Mexico is perfectly set up to fuel a hurricane if circumstances allow for it to form in the center after a warm summer in August or September. If surface water temp of the ocean is the main factor, this makes sense. Harvey’s got this type of situation that’s all over warm water and undisturbed by land. That matches the terrain in the webcam view and the description of being “towards Bob Hall pier”. Also, based on the HMON model, is right at the place where the strongest part of the eyewall will make landfall… plus, the gust front from one of the leading feeder bands is only about 48 km offshore from the camera. It should be arriving soon. Albert, thanks so much for your great article on CO2 emissions. The scoreboard being 34-1 humans is a huge eye opener and not something I was aware of. Glad to hear! The final result of the poll was exactly 50:50 between volcanoes and humanity being dominant. I actually took this question from another poll, some years ago, where a large majority blamed volcanoes. The facts are pretty clear, as you say. It looks like an eyewall is forming in the southern part of the storm. I assume it will drawn in the big northern band, not sure about that, I’m not actually a meteorologist, but if that northern band gets drawn in I think it will be a powerful storm that hits Friday night maybe around midnight. The storms of the extant northern band are the remnants of a front that dropped down here yesterday or so. If there is still much left of it, it will aid in Harvey going extra tropical. The dynamics will turn it from a warm core low to a cold core low. In cold core lows the intensity is driven by horizontal air differences. I’m on the back side of that front and the air is still pretty hot and humid. Dunno if the front will have much of an effect. This is the GFS models take on it. Based on this, the 28th should be near maximum strength… structurally. But, the spagetti plot (the output of all the models plotted together) shows max intensity in about 24 hours. Somewhere in the high Cat-2 range. 26th not 28th. Even with that, the forecast seems to be having it wobble up the coast to the north, not actually driving inland and still able to feed off of the gulf of Mexicos hot water. This thing is gonna be pumping some serious water ashore. Normally dry river beds are gonna quite dangerous. estimates from the Stepped Frequency Microwave Radiometer remaining near 75 kt. The aircraft also reported that the central pressure has slowly fallen to 973 mb inside the 16 n mi wide eye. Based on these data, the initial intensity remains 75 kt, and this could be a little conservative. These discussions are always informative and really helpful if you are trying to understand these critters. For those of you that are a bit put off by the Hurricane stuff, here is something to consider. When Pinatubo had it’s main eruption, it was during Typhoon Yunya passing overhead. Hurricanes and Typhoons (same critter, different name) can draw down the elevation of the troposphere over the core (eye) of the system. This could have enhanced Pinatubo’s ability to inject SO2 directly into the stratosphere. Yeah, it’s unrelated to Harvey, but it’s a nice side topic that links the two fields. Image source; Wikimedia commons for Tropical Cyclone. The scary thing I heard yesterday was the rainfall prediction – 50 mm for a 24 hour period and 1 metre for a week. Where I live in central England, a metre is our average rainfall – for a year! It’s quite inconvenient, but massive rainfall is sort of a Gulf Coast thing. There will be some ponding/flooding, but for the most part, the water doesn’t have that far to go to get back to the sea. Usually the biggest worry are the critters trying to escape the flooding. I’m not fond of snakes. Update 19A puts the winds at 105 mph. And now down to 958. That seems to be going down at a rate of -5 mbar per hour, or in other words, the core is losing air at a rate of 0.5% per hour. Where does it all go. Down to 950 mbar. The pressure is off..
Hope your family stay safe Lurking! And now reports from the weather plane of Cat 4 winds spotted. 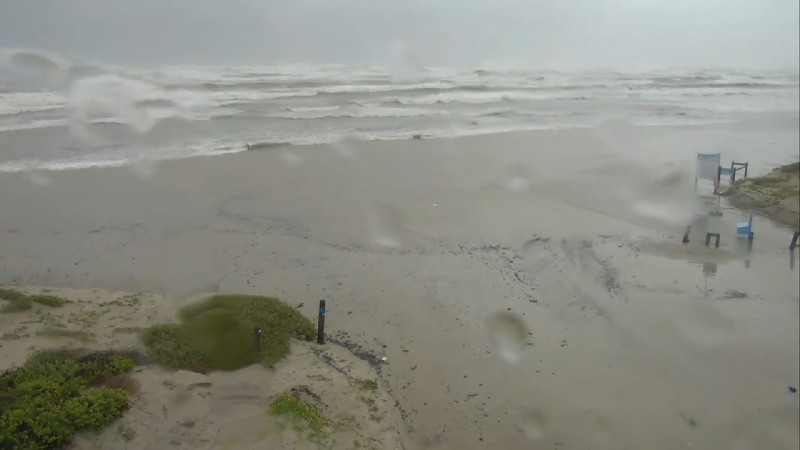 And now it’s raining its arse off on that webcam view, and the water is up to the beach entrance where that weather channel twit was standing earlier. And alligators in the streets. And while Texas gets wet, a decent earthquake in the North Atlantic at the Atlantis II Seamount, part of a volcanic chain pointing at Boston. Atlantis is stirring..
Bertolaso is not INGVs director, he’s not a geologist, he is civil protection director. Thanks for the fact check. It has been changed. This came from the old post, and was based on an article from 2010. Getting a bit rough out on the beach. Last update I read indicated that Harvey has a double eyewall. 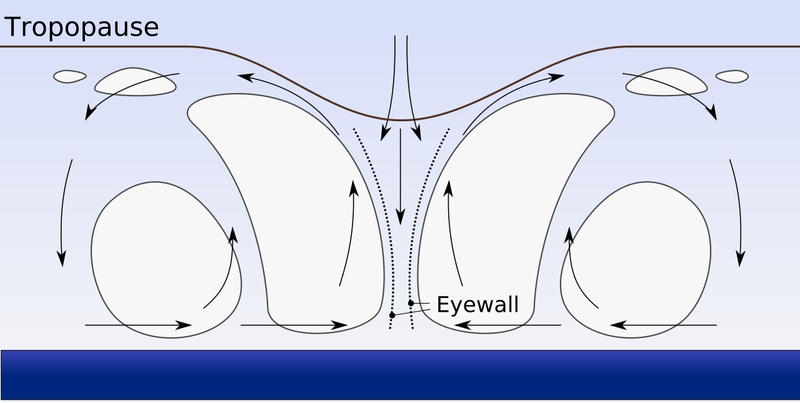 This is typical during an eyewall replacement cycle and usually the winds drop down a bit until the new eyewall contracts. Unfortunately, eyewall replacement cycles tend to only happen in well formed and healthy storms. I may be crazy, but I’m not that stupid. Definately a web cam. It’s the same one I was posting from yesterday. If you scroll up you can see the same image from yesterday for comparison. Yesterday I was watching the police running people off the beach and some guy making his own sand bags. A weather channel twit stopped by and did a quick broadcast and hauled arse. It is now reported as a category 3, with central pressure of 941 mbar. Low enough that that cup of tea you’ll need in the eye of the storm won’t be quite as hot. Well, that ends that streak. 4324 days with no major hurricane striking the US coast. Current screeching weather twits are pointing at it bouncing along the coast. The track model outputs are all over the place. That doesn’t bode well for anyone stuck underneath this rain pump. Self-serve sandbag program has been completed. 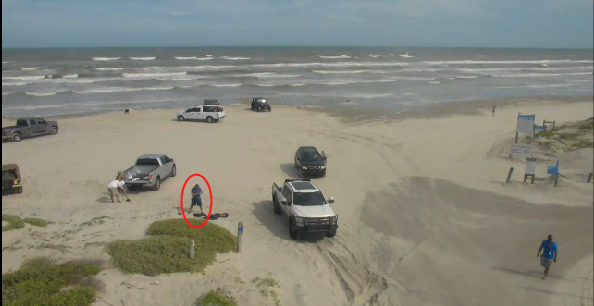 NOTE: It is ILLEGAL to bag sand from area beaches according to Corpus Christi Code of Ordinance Section 10-17 and Texas Natural Resources Code 63.091. Here in CA the bagged sand comes from Montery bay. A Mexican company bought and old cement plant and continues to mine the beach as they claim the lagoon is above the mean high tide level. This sand is sold Nationwide at Home depot for about 2 bucks a bag. There are a bunch of webcams on you tube. The comments on those live streams are incredibly ignorant. That explains why the guy in the red circle of the screen cap took off when law enforcement showed up. Video of Hurricane Harvey from the Space Station. Any insights on the spaghetti forecast, or does anyone have a crystal ball? And this, is a really really bad sign. It means that there is no dominant steering mechanism. Essentially the storm will just park until something pushes it one way or another. And, the official forecast reflects that uncertainty in the models. San Patricio County fire is having fun, they are out responding to a structure fire in this mess. Dunno what sort of structure it is, they are still enroute. The address was evidently in question so they responded to both address possibilities. The first unit found nothing, the other unit found a working fire. The evacuees have arrived here in Austin. Grocery stores are slammed, lines down the block. It was already pretty crowded here, too. I imagine that every single hotel room is booked. On that fire call I was listening to, they have backed off on the engine pressure to conserve water and pre-staged two crewmen to do a primary search of the residence so they can get back to the station since the weather is growing bad fast. Their second unit is going to dump his remaining water into the primary engine so they can start wrapping up that call. but they seem to be a little bit more sure now that he will circle and go west of Houston. Looks like Harvey may have peaked at Cat 4, hope people found a Safe locale. 10pm, the forecast is 100% uncertain. For information, I check the below regularly, as I am sure all of you do. Raining sideways now. But I got the dogs out before it started. 4.2 Bardy at only 0.7 km depth. And a 3.8 at only 1.4 depth. Plug settling, or something else? And about Etna, inusual number of quakes in last days. I’m italian, and my question is: why we have not volcanoes real time gps data, or real time chemical data, or quakes data revision within a day? Is it State secret in Italy? I envy an internet site like Icelandic Met Office one. 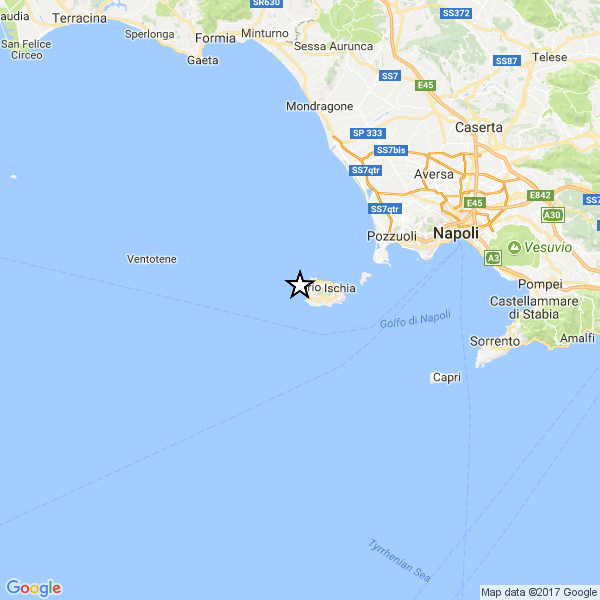 After some days Ischia’s quake data are changed, epicenter was not in the sea, but on the island near Casamicciola, the depth was 1 km. It mainly has to deal with money and what best serves the politicians controlling it. Etna has a really good monitoring system, along with a highly skilled group of professionals. But, that is because Etna is recognized as a real and persistent threat. I think if you look into it, whoever represents the administrative district containing Etna, got there because he recognized the concerns of the citizenry… and was good at relaying the importance of keeping an eye on it to the rest of the countrys representatives. As for Icelandic Met, volcanoes are constantly reminding them that they are there. Iceland has had some pretty bad results from some of those eruptions. It’s only natural that they are gonna want to know what they are up to in order to mitigate the hazard. My personal philosophy on how to survive a normal volcanic eruption with 100% effectiveness, is to not be there. If you live near one, it makes sense to keep an eye on it. And politicians often downplay or turn their back on info from scientists and experts if the info is bad for their economic or power interests. 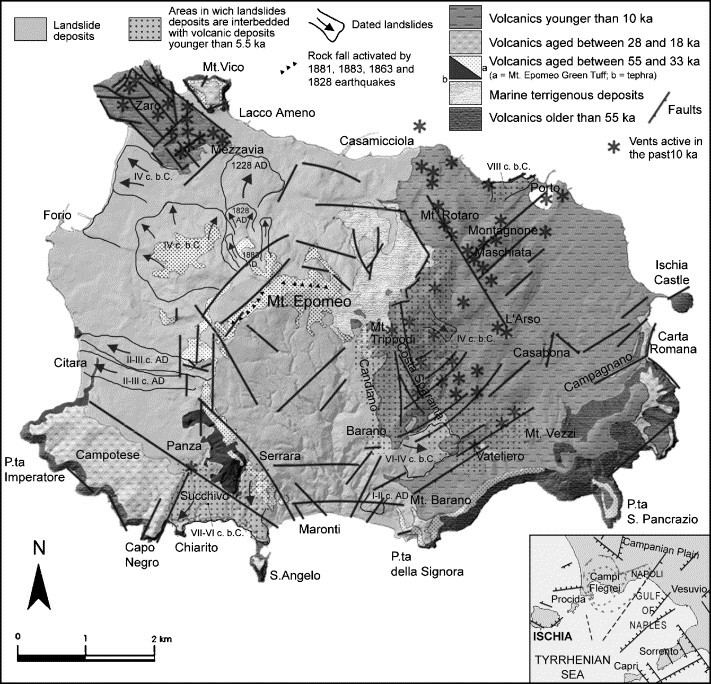 Imagin the land prices in the Napoli general area and how more geological info could impact! Probably they feel that risk much more scary than the risk of a volcanic catastrophy. Women in astronomy in a time when women were excluded from academic jobs. There was considerable talent there and at Harvard, they did get proper acknowledgement and respect for their work. Cannon’s work especially is Nobel-prize level -which she couldn’t get because she had no academic position. I once corresponded with one of them, Dorris Hoffleit. Probably my main claim to fame. I made it! I feel tremendously lucky since there is complete devastation everywhere and I am only a few feet above sea level, Harvey is not done yet but I sure hope the worst is over. continuing good luck sent in empout’s direction, sadly I fear the worst is still to come. New post is up: an opinion piece.